“The ghost-stories are begun by all but me,” John William Polidori wrote from Geneva on 17 June 1816 as one of five participants in perhaps the most famous literary competition of all time. Polidori was the handsome, arrogant, and often quick-tempered outsider in a group that also included Percy Shelley, radical poet and thinker, and a married man; his lover, Mary Godwin, the only child of the philosopher William Godwin and the passionate advocate of women’s rights, Mary Wollstonecraft; Lord Byron, the most celebrated (and then notorious) literary figure of the age; and Claire Clairmont, Mary’s step-sister and Byron’s newest mistress. Percy and Claire soon dropped out of the contest, and Byron stayed involved only long enough to produce “Augustus Darvell,” a short prose fragment in which a dying man extracts a sinister vow of silence from his devoted friend. Mary and Polidori, however, each completed the competition by writing a tale of terror in which they exploited both their own personal demons, as well as the sexual tensions, literary ambitions, and vast intellectual interests that defined their group. It is a remarkable thought that the same ghost-story contest produced our two most potent modern myths, both of which have gripped the popular imagination for nearly two centuries: Shelley’s Frankenstein (1818) and Polidori’s The Vampyre (1819). The title page from the book version of John Polidori’s The Vampyre, here wrongly attributed to Lord Byron. It is perhaps not surprising that Polidori did so well in the contest. He was a highly accomplished young man from a distinguished literary family. His father, Gaetano Polidori, was an Italian immigrant who served as secretary to the poet and tragedian Vittorio Alfieri, translated John Milton’s poetry into Italian, and wrote his own fiction and drama. His sister Frances was later the mother of Dante Gabriel Rossetti and Christina Georgina Rossetti. Polidori was educated at Ampleforth, a Catholic college near York, and then at the University of Edinburgh, where he wrote a tragedy on the subject of filicide, completed a thesis on somnambulism, and received his medical degree at the unusually early age of 19. Philip Burne-Jones, The Vampire (1897). Polidori maintained a precarious place in the Byron-Shelley circle throughout the summer of 1816. In late August he completed his tale of The Vampyre, where he drew on Byron’s fragment “Augustus Darvell” (a debt he openly acknowledged), as well as on a series of recent poetic treatments of vampires, including Robert Southey’s Thalaba the Destroyer (1801), Byron’s own The Giaour (1813), and Samuel Taylor Coleridge’s Christabel (1816) — all of which had fleetingly introduced vampiric figures or direct references to vampiric folklore. But at the same time Polidori pushed dramatically beyond these precedents, not only by giving the conventional figure of the upper-class rake new and fatal powers of seduction, but — more crucially — by transforming the foul-smelling ghoul of earlier vampiric mythology into the wealthy and mobile aristocrat whose violence and sexual allure make him literally a “lady-killer.” The result is a tale of guilt, paralysis, wish fulfillment, and entrapment in which the worshipful Aubrey’s enthrallment to Lord Ruthven is often read as Polidori’s projection of his own passive submission to the domineering presence of Lord Byron. Yet in true vampiric fashion, Polidori also resists Byron, borrowing the name “Ruthven” from Lady Caroline Lamb’s recent unflattering portrait of him in her novel Glenarvon (1816), and portraying him in the tale as false, predatory, and remorseless. The Vampyre was first published on 1 April 1819 in the New Monthly Magazine, and immediately thereafter as a book. In both formats it was attributed to Byron, though Polidori soon established himself as its author. The tale created a sensation in Europe (Goethe, still under the impression that it belonged to Byron, thought it his masterpiece), but Polidori was unable to capitalize on its success. A year later he decided to renounce both literature and medicine and study the law, but by this time he had become ruinously fond of gambling. In August 1821, after a disastrous three-week spree at Brighton, he returned to his father’s house in London, where he died at 25 years old, and almost certainly by his own hand. 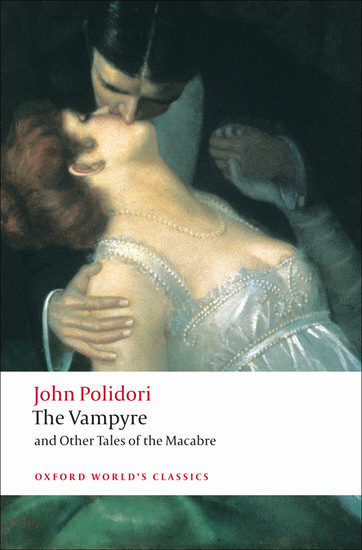 The vampire figure he created, however, continues to outwit death, for Polidori’s contribution to the ghost-story contest established the model for the entire modern tradition of vampire fiction, and touched off a vampire craze that still shows no sign of diminishing. Robert Morrison is Queen’s National Scholar at Queen’s University in Kingston, Ontario. For Oxford World’s Classics, he has edited The Vampyre and Other Tales of the Macabre (with Chris Baldick), Thomas De Quincey’s essays On Murder and De Quincey’s Confessions of an English Opium-Eater and Other Writings (forthcoming next year). Morrison is the author of The English Opium-Eater: A Biography of Thomas De Quincey, which was a finalist for the James Tait Black Memorial Prize in 2010. His edition of Jane Austen’s Persuasion was published by Harvard University Press in 2011.